When a customer pays for their order a notification is triggered from eBay which prompts Brightpearl to download it. This will mark the order in Brightpearl as paid and create the accounting for the payment. PayPal fees are not accounted for. Refunds are not handled by the integration and will need to be processed manually. Payments will be automatically downloaded from eBay at the point that they are received. This works by listening out for the eBay API notifications which let Brightpearl know when to download. If for any reason a notification is missed Brightpearl performs a full download on a daily basis. Alternatively, you are able to trigger a download at any time using the "Download" link on the Recent Sales List - this works for orders and payments. 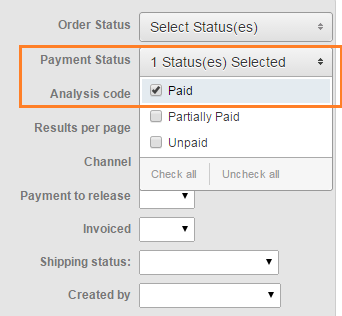 If an order is paid upfront at the point the order is placed, then it will download as paid. Although a feature eBay are phasing out, there are still some eBay sites which continue to allow buyers to "Commit to buy" without making payment. In this case Brightpearl downloads an unpaid order and allocate the inventory to ensure it is reserved. When the payment is received it will be downloaded to mark the order as paid. You can filter to only paid orders on the sales list to ensure that you only ship those which are paid. Payments imported from eBay will be created using the payment method selected on the channel. The accounting for the payment will be created using the bank account saved on the payment method for the relevant payment currency. If no bank account is set for a foreign currency payment, the base currency bank account will be used. If no bank account is set at all, no accounting for the payment will be created, but the order will be marked as paid. A refund will usually only be required where there is an existing order. The order will also need to be cancelled or credited, depending on what stage it is at through the sales process and it may also include receiving back inventory. All order cancellations and credits will need to be processed in both Brightpearl and eBay. It is important to cancel/credit in Brightpearl to update records and create accounting entries, and important in eBay to refund the money, update order records and inform customers of what has happened with their order. Processing a refund in Brightpearl does not move money. A refund can only be recorded in Brightpearl via a sales credit and will usually be included in the process of receiving returned items or cancelling an unshipped order. Clone the original sale to a sales credit. Mark the credit as credited. Receive the inventory on the credit to update stock. Mark the credit as refunded. The refund to the customer will need to be processed via eBay/PayPal.